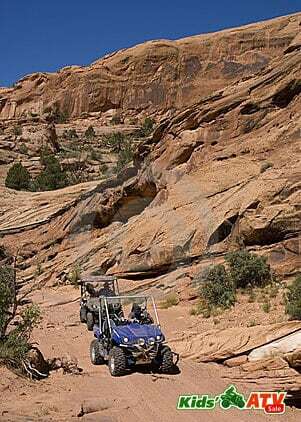 Off-road ATV-ing is an exciting activity for friends and family. Through operating ATVs, youngsters learn basics of driving skills. Operating a vehicle develops self-confidence, and a sense of accomplishment. Moreover it’s a nice way to spend time outdoors. Many families make it a pleasant weekend family time with their kids. No matter how old or young the driver and no matter how large or small the ATV is, off-roading involves certain responsibilities. While drivers and riders should have fun with their ATV they should never treat is as a toy. Before hitting the trails, drivers should learn how to operate the ATV is a safe place like a driveway or a field. Trails can pose some challenges and riders of all ages should know how to control speed and the machine on level ground before attempting twisting and hilly trails. There is no one age when every child is ready to go off-roading. Parents know their kids best so they are in the best position to decide when a youngster is ready to ride. These guidelines might help parents reach an informed decision. To ride off-road safely, a driver needs to be large and strong enough to reach the controls. Have your child sit on the vehicle he will be driving. His arms should be long enough to turn the handlebars to the right and the left to steer. His hands must be large and strong enough to operate the brakes, throttle, and other hand controls. His feet must be able to operate the brake and other foot controls. Can he stand on the footrests and hold the handgrips? There should be a minimum of three inches between the vehicle seat and the child’s seat so that when he rises off the seat he will have balance and visibility. Off-road riders must have good hand-eye coordination, agility, and balance. Those children who can accomplish such skills as: riding a bicycle, skateboarding, playing baseball or soccer will likely have the physical skills to operate an off-road vehicle. While things like size and eye-hand co-ordination are somewhat age-dependent, using common sense while riding a vehicle is more a question of having good judgment and gaining experience. Both riders and drivers must be able to think and react quickly. Can your child analyze problems and reach logical solutions. Does he get the relationship between actions and consequences? Can he follow instructions? Can he set safe limits on his operation of an ATV? If your child is too small or uncoordinated he isn’t ready for off-roading as a driver. Perhaps he is big enough to ride as a passenger. All off-road riders need safety equipment. The most important item is a high-quality motorcycle helmet. The label should assure the buyer that the helmet is approval by the US department of transportation (DOT). Your child’s helmet should fit snugly and fasten securely. Drivers also need goggles, sturdy boots, gloves, long pants, and a long-sleeved shirt or jacket. Off-roading can be a great sport for kids and for the entire family. Before you head out make sure everyone has the right safety gear and an ATV that is the right size for them. It is important that they have had experience operating an ATV in a safe environment before any driver heads out for an off-roading experience.